Cedar Grove includes most of FCUAC district 9 (whose northern part is included in the May Valley Basin subarea). The area is dissected by Cedar Grove Road which runs from the Issaquah-Hobart Road to SR 169 (Maple Valley Highway) and also includes the area at the farthest east part of the east Renton plateau. 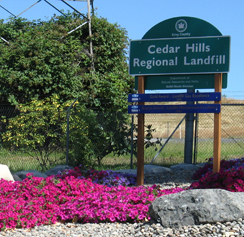 Along the north side of Cedar Grove Road lies the Cedar Hills Regional Landfill, a large expanse of land that lies on the hillside south of May Valley, and Cedar Grove Composting. South of Cedar Grove Road are small, high-end residential developments.